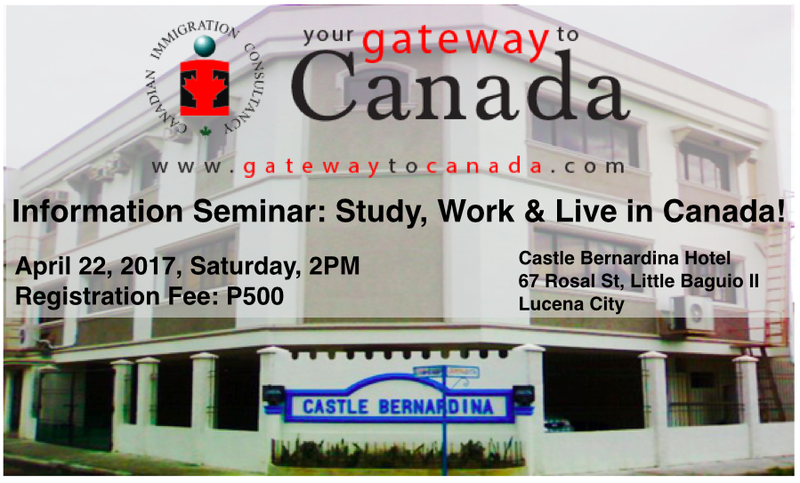 Canadian Immigration Consultancy Goes to Lucena City! - Gateway to Canada | Canada Immigration Consultancy! Canadian Immigration Consultancy Goes to Lucena City! Canadian Immigration Consultancy (Team PIA Corp) will be in Lucena City this coming April 22, 2017 to conduct an Information Seminar. If you are interested to study, work and live in Canada, attend this information seminar to know your options! Register here to reserve a seat. Information about visa application to Canada is available for FREE at http://cic.gca.ca. Only ICCRC Registered Immigration Consultants or Canadian Immigration Lawyers are authorized to represent you for a fee. Clients of Canadian Immigration Consultancy are represented by an ICCRC Registered Immigration Consultant.